Saturday night I completed Level 2 Improv with the Magnet Theater! For 8 weeks I had the pleasure to work with some of the most delightful people!! Thank you to our fearless leader, Luis Kornfeld. What a fantastic experience!! Anne is in the Ocean’s 8 Film as Daphne Kluger’s dinner guest wearing Victoria Beckham! She had a wonderful time working on this Film!! Robin Hood is New York City’s largest poverty fighting organization. Anne and 50 other dancers helped to open the Gala and introduce JLo!! Choreography by the amazing Chris Bailey and Sarah O’Gleby!! Anne had a blast taking Improv classes at the Magnet Theater over the past 8 weeks with Rick Andrews!! 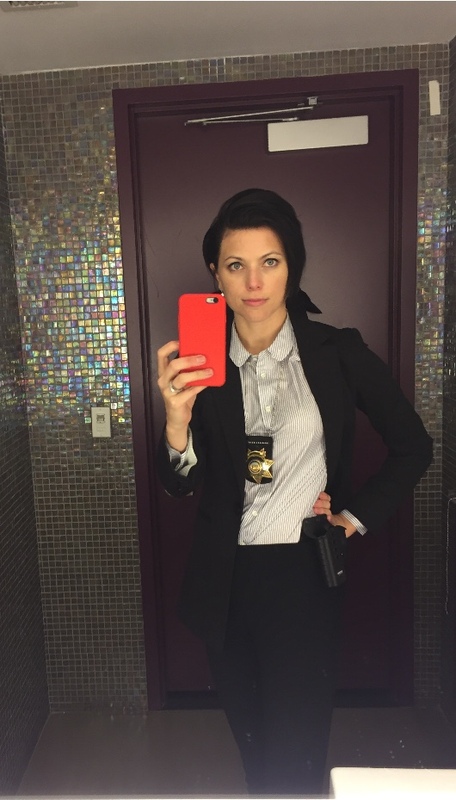 Anne is Armed & Dangerous on set of the TV Pilot, Deception! Spreading a little Holiday cheer!! Happy Holidays & cheers to a smashing New Year!!! Choreography by Ray Hesslink!! This was such a fun project to film. Please Enjoy! Times Square Lady Liberty isn't having a great day..
A wonderful short film about a Dancer finding her way in NYC by Gina Ducci & Eric Mann. Anne plays the role of the Choreographer. Anne plays the Choreographer in a new short film, STRIVING!! Gina Duci created & stars in her story of surviving in NYC. Directed by Eric Mann. What an amazing afternoon celebrating this incredible show, Chicago! This show changed my life when I was 13 & I am honored to be part of this family! Anne was recently used for an Actors Fund promotional shoot. Check out Damianiny.com for the most FABULOUS & LUXURIOUS coats of the season!! It was an honor to work with the amazingly talented Caitlin Cannon!! We had an hour of studio time & here is a piece of the result. Enjoy! Print shoot for DAMIANI!! Photos to come!!! Anne is a fit model for Peloton Cycling. Leah Gerstenlauer interviews Anne for Dance Informa Magazine, about Hugh Jackman’s Broadway to Oz. Anne plays Velma in Chicago the musical’s new casino game!!! Anne will be joining old & new cast & crew in Australia for the Hugh Jackman Arena Tour. The show will open in Melbourne November 24 and close in Perth just before Christmas. Happy New Year from this Showgirl!! Thank You Istanbul!! See you at the end of May! Private Jet from Las Vegas!